Among the different types of weapons one of the oldest and still in use today along with modern firearms is an ordinary hunting bow. Such a bow can be a good assistant for each hunter that will be able to hunt medium-sized game as effectively as with conventional guns. To make a hunting bow can be their own hands. The quality of the finished bow depends on many parameters, such as, what made himself a bow, taut as a bowstring, how well chosen the arrowheads. As the material for the bow it is best to use the tis – thanks to the homogeneity, flexibility and strength, this wood is well suited for this purpose. However to find this kind of wood today is not easy, so you can try to make a bow from elm, willow, ash, hazel, and even from birch or cedar. If you want the onions were strong and functional, it is recommended to make a composite bow made of three different parts. If you want to make a more simple bow, only one part, but the tree needs to be long. To create a simple bow take solid wood and measure the size of future harvesting – to do this, attach the end of a wooden branch to the hip with one hand, straight second hand and pushing her aside. Hunting bow should not be too large. Completing the blank for the bow, ensure that the thickness of the bow in the Central part was at least 5 cm. At the ends the thickness of the wood should be 1.5 cm At the ends of the bow also need to cut grooves for tying the string. Before machining, remove the tree bark, and then, after final processing, apply to the surface of the workpiece the oil or fat. 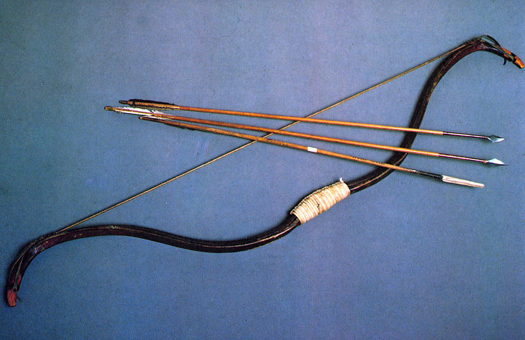 Compound bows, unlike simple, composed of three wooden parts of the frame serving as the basis for the bow, handles and horns. Both bows should be equal in length. To handle – the middle part of the bow – choose durable wood with straight fibers, the most solid part of the tree. Dry timber in the open air, then cut them from the constituent parts of the onions and process them. Glue the parts together with fish glue and impregnate the frame with resin. Fasten splices of parts of onions, wrapped their tendons. Re-saturate splices grease or resin. Modify the bow and if necessary, paste over it just boiled in water with strips of birch bark. Once dry, the bark shrinks and pulls the bow. The tips of the horns of the bow should be made the slots for the string. The string itself you can made of different materials – for example, take a strip of leather with a thickness of 3 mm or twist the cord from animal sinew. Crafting and pulling the string, and make arrows with tips and a tail – now onion can be used for other purposes.